Set oven rack in middle position. Heat oven to 350 degrees. Line cupcake wells with cupcake liners. Pour milk, egg whites, and extracts into 2-cup glass measure, and mix with fork until blended. Add all but ½ cup of milk mixture to crumbs and beat at medium speed (or high speed if using handheld mixer) for 1½ minutes. Add remaining ½ cup of milk mixture and beat 30 seconds more. Stop mixer and scrape sides of bowl. Return mixer to medium (or high) speed and beat 20 seconds longer. Let cakes rest in pans for 3 minutes before removing and leaving to cool on wire racks. Reduce speed to medium and add the sugar, 1/2 cup at a time, beating well after each addition and scraping down sides of bowl as needed. After every two additions, raise speed to high and beat 10 seconds to aerate frostong, then return to medium. Melt chocolate chips on medium power in a microwave safe bowl, stirring every 30 seconds until completely melted. 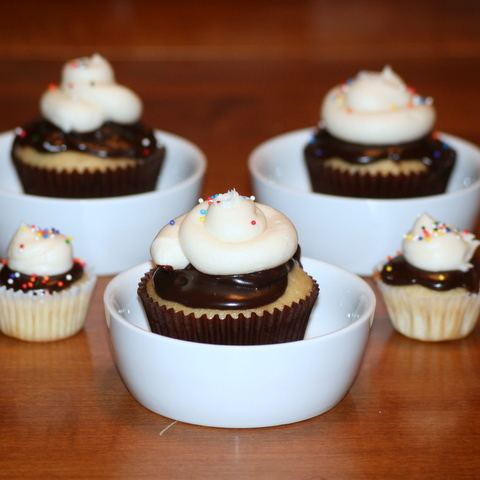 Top the center of each cooled cupcake with about 3/4-1 tablespoon melted chocolate, allowing to spread a little before topping with frosting. To frost use a pastry bag with a large round opening tip, such as Wilton #1A. Garnish with sprinkles, chopped nuts, cherries, etc. as desired. Sources: Cupcakes - adapted from The Way the Cookie Crumbles Frosting - Martha Stewart Cupcakes Ganache - original "recipe"
you did a great job with them.